Finding a good beauty product is like making a new friend, but finding a product that can help with practically everything is like finding the holy grail. Coconut oil, which is all natural and available at just about every grocery store within a two-mile radius of wherever you are right now, is that holy grail. 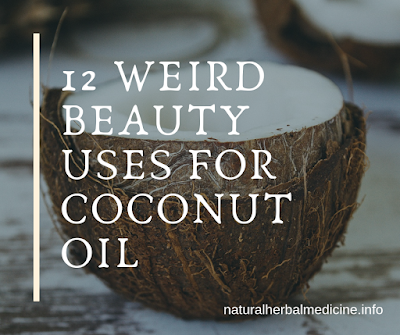 From working as a natural sunscreen to helping rehydrate your dry hair, below are 12 weird beauty uses for coconut oil. Oil Pulling: If you haven’t heard all the buzz about oil pulling yet, get yourself on the bandwagon. Swishing coconut oil around in your mouth for 20 minutes a day (preferably at the beginning of the day, before you brush your teeth) can help to detoxify your body, cure headaches, whiten teeth, and much more. Cuticle softening: Our cuticles need a little T.L.C., and if you’re fresh out of cuticle oil you can substitute coconut oil. Aim to apply to your fingers twice a day, especially if you spend a lot of time washing your hands every day. Ends of your hair: For ladies with regular to thick hair, using a pinch of coconut oil on the ends of your hair can help dry, damaged tips to get a huge dose of moisture. Body scrub: Use coconut oil as a base for your DIY body scrub, mixing in an exfoliant like granulated sugar for some seriously smooth skin. Inside your nose: Whether you have a runny nose or allergies, rub just a bit of it inside your nostrils for relief. Lip Balm: Spread coconut oil over your lips before bedtime for extra hydration (that tastes amazing!) throughout the night. Makeup remover: Trouble getting off that last bit of mascara? Use a dab of coconut oil — just be careful to not get it directly in your eyes. Shaving cream substitute: Instead of using shaving cream, apply coconut oil to your skin and then go about shaving. This’ll be especially helpful if you have sensitive skin and get irritated easily. Plus, it’s easier on the razor when it comes to cleaning. Wrinkle prevention: Use coconut oil on the area around your eyes to prevent wrinkles and under eye bags. Acne treatment: Put the coconut oil on acne and leave on for about 15 minutes, then wash off with warm water and don’t use anything on top. The anti-bacterial components in the oil will work to combat acne. Hair regrowth: Known to help with cell regrowth, apply coconut oil to any areas of baldness (especially your eyebrows) to help with hair growth. Sunburn relief: Though it can be used as a natural sunscreen, coconut oil can also be applied to the skin for sunburn relief.